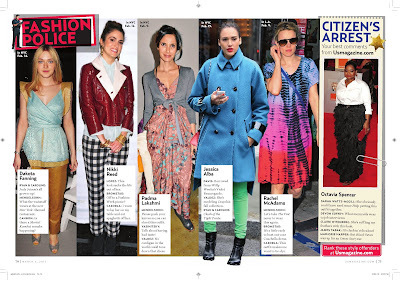 This time I gave a citations to Jessica "don't call me Latina" Alba and Top Chef host, Padma Lakshmi. Those who know me know that I am not the biggest fan of J. Alba (besides her being Honey Daniels in the movie about a struggling dancer who makes it called Honey) because she throws mas shade about her being a Latina. As I proud Latino I have no choice but to side eye her like there is no manana! As for Padma, I honestly had to Google a girl to find out who she was. Had she slowly posed in the corner of my television screen as I watched Bravo, I would have known who she was, but seeing a picture of her in this horrid outfit that should have been sent back to the kitchen just didn't trigger my memory! 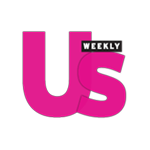 I am having so much fun contributing as to Us Weekly as a Fashion Police Top Cop and I love when people tell me that they are flipping straight to the back to see if I am commenting that week (it's the little things in life)! Keep on checking out Us Weekly (this issue is on newstands now) and keep on checking out OJ&B for more celeb and fashion fun!